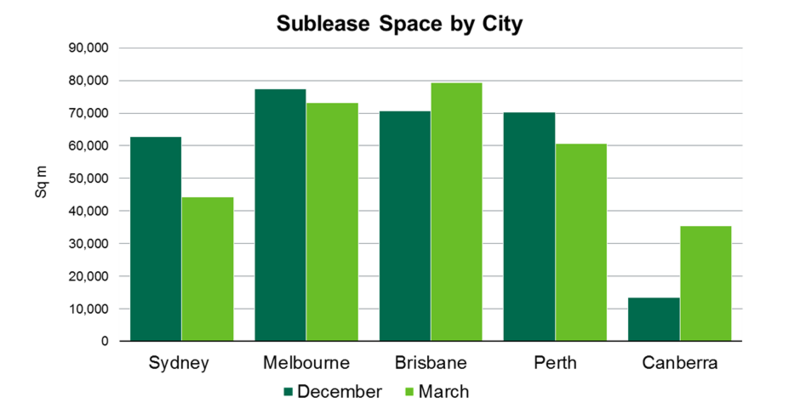 Sydney, 7 May 2014 – Sydney continues to be the national leader in relation to improvements in the sublease office market according to new research from CBRE. CBRE’s latest Sublease Barometers show that the capital city markets are diverging, with Sydney, Melbourne and Perth all recording a decline in sublease space during the quarter, with increases occurring in Brisbane and Canberra over the same period. Sydney and Perth recorded the biggest improvements in Q1 with the volume of available space dropping by over 18,483sqm in Sydney and by 9,502sqm in Perth. In Melbourne, the volume of sublease space declined by 4,200sqm. The laggards were Canberra and Brisbane. CBRE Regional Director, Office Services, Andrew Tracey said a reducing headcount in many Federal Government departments was continuing to impact Canberra, where the stock of sublease space increased by 37% in Q1 to 34,424sqm. In Brisbane, the availability of sublease space rose to 74,400sqm as at the end of Q1, well above the historic average. The latest reports highlight that the market influencers - and future forecasts - vary significantly on a city by city basis. Sydney, the city with the highest capital city exposure to the finance sector, was one of the markets most afflicted by sublease space post the GFC. However, the market has shifted as landlords negotiate deals with tenants to break their leases, at a cost. “Twelve months ago, a significant proportion of sublease space on the market came from tenants who had relatively short lease tails but believed they had enough time to get rid of space. They did not understand that incoming tenants wanted long term certainty in deal structures,” Mr Tracey said. 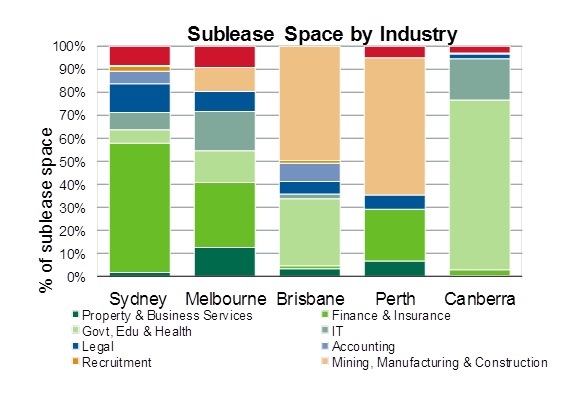 The other major mover in Q1 was Perth, where the volume of sublease space fell by 9,502sqm to 60,720sqm. The majority of the reduction was due to withdrawals and sublease space reverting to direct rather than an increase in leasing activity. However, Mr Tracey said CBRE expected an improvement in demand, particularly during the second half of 2014. 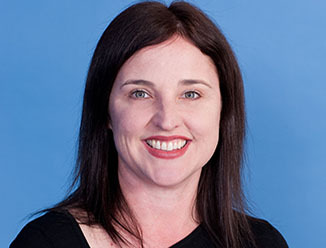 The city most afflicted by sublease space is Brisbane, although the volume of available space has dipped from the market peak of 83,000sqm of space in January this year. There are 42 individual leases available in Brisbane across 79 full or part floors, mostly being offered by the resource sector and the public service.